Four marine monsters to paint and play with. Dare you take them in the bath? It’s up to you. 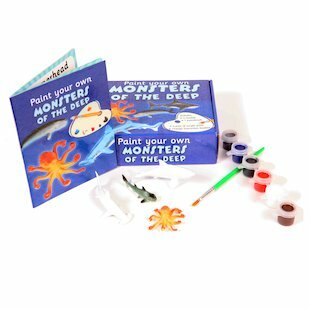 This model kit includes two scary sharks to nibble your toes off, plus a whale and a giant octopus. Totally realistic and really easy to paint! You can collect them, swap them, play with them or exhibit them in your room. Finally: create your own cool indoor aquarium. Who needs a Sea Life Centre trip?